Hosted over two days in the prestigious Schlosshotel Monrepos in Ludwigsburg, close to Stuttgart in southern Germany, Ricardo Software’s UserCon Europe is a very popular technical conference aimed at those engaged in CAE research and advanced applications within the automotive and transportation sectors. The theme of this year’s event is ‘The Future of Mobility’, with the aim of exploring the challenges faced by industry in terms of the impact of virtualization on transport design. Within this theme, key topics of discussion will include: understanding the mechanical challenges relating to virtualization of powertrain design; the future of internal combustion engines and how to optimize performance, and; is industry fully ready for electrification in terms of the delivery of a comprehensive product range offering comprised of hybrid and electric vehicles? In addition to the presentation of Ricardo’s vision for the development of new CAE simulation methods and capabilities, a number of detailed technical presentations on innovative research initiatives and applications will be provided from a range of key Ricardo Software customers and technical partners. The programme of presentations will be delivered over two days, with separate streams for mechanical systems simulations, and for fluid dynamics and acoustics. 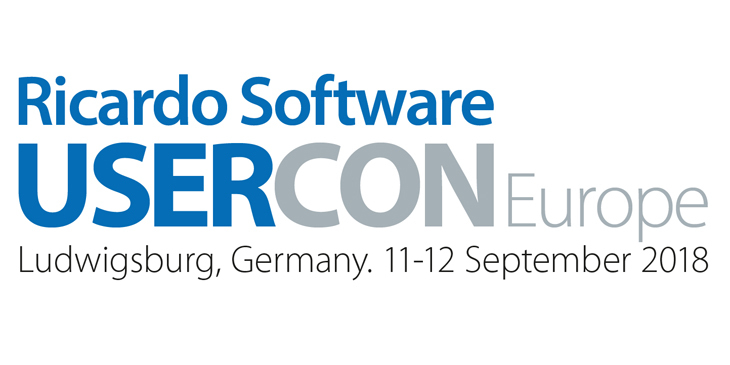 Introduction of PISDYN flexible pin feature – Andrea Negrisolo, Duraldur S.p.A.
Full information for Ricardo Software UserCon Europe 2018, including registration and accommodation details, can be found here: https://software.ricardo.com/events/september-2018/ricardo-software-usercon-europe-2018.